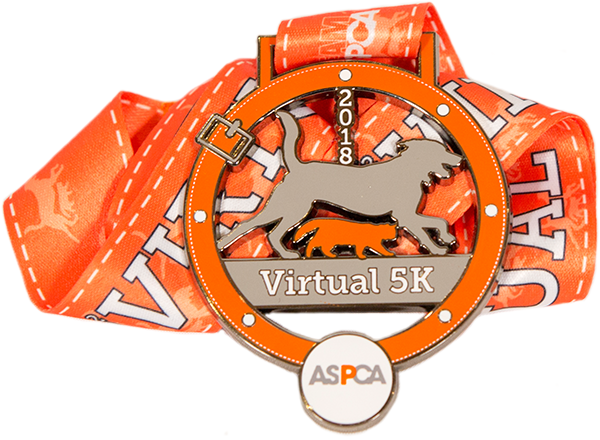 I will be participating (with Lulu) in the 2018 ASPCA Virtual 5K! I am excited to be participating and honored to be raising the awareness and the much needed funding to support the ASPCA's programs. Your donation will help the ASPCA provide life-saving programs and services to millions of animals nationwide. The ASPCA is very important to me and I appreciate your help as we fight to give abused and homeless animals a second chance at life. Please support me by making a donation and help me make a positive impact in the lives of animals! Thank you! We completed our run in Maine while on vacation. During the second day of our run (and one of the only times on our run even during practice!) Lulu happened to need a potty break...luckily it was in the last stretch (1/4 mile) of our run. I ran in place until she finished and then it was a challenge to hold my biodegradable bag with one non-swinging hand while running:)) Regardless, we trained with a lot of uphill and downhill and that's what our whole course consisted of so I was proud to have finished the run with some extra challenge. And breathing was a lot easier in Maine (their motto "you're in Maine, breathe easier" is not in vain:) versus the heat, humidity and presumably additional pollution of the city. We ran 1.75 on day 1 (8/12), then completed a 3 mi hike then ran 2.35 on day 2 (8/13). So our consecutive run over 2 days was 4.1 miles or 6.598 kilometers:) So thanks to Lulu, for helping to motivate me; we will continue this trend going forward and hope to participate next year! Backstory: ​I adopted Lulu in 2017 from Apollo's Angels in Paterson, NJ. She is a total joy - and half collie/border collie- and full of energy. As an equestrian since a child, I've had many riding related injuries, the most recent which was the most serious. I was never a competitive runner - I just made a point to do so at the gym each week or so. I mainly take barre classes. My injury to my pelvis was so bad however, that I the pain prevented me from running for over a year. With the help of my routine pilates and barre classes, which I have always been dedicated to, my muscles and alignment felt rehabilitated after a year. Lulu's energy and enthusiasm to be outdoors was a wonderful motivator for me to start to ease into running again. I also loved having that bond between us, as I put my running sneakers on or went for the special leash we used, she would get so excited her little behind would start wagging frantically and she would start crying with anticipation to go out and run. She wound up really pushing me! In fact, I used a hands free leash to maximize my run and control with her from Found My Animal, so she was literally often pulling ahead, with me trailing behind. At times I even felt like I was skijoring minus the relaxation on my part:) We then (or should I say, I then), got more in sync with Lulu and picked up the pace. I started feeling very motivated to improve my health with more cardiovascular training so this virtual challenge came at the perfect time.